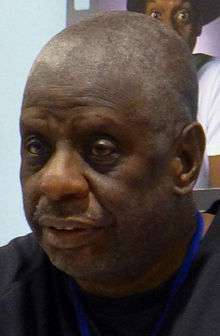 James Carter Walker, Jr. (born June 25, 1947), known professionally as Jimmie Walker is an American actor and comedian. Walker is best known for portraying James Evans, Jr. (J.J.), the oldest son of Florida and James Evans, Sr. on the CBS television series Good Times which originally ran from 1974–1979. Walker was nominated for Golden Globe awards Best Supporting Actor In A Television Series in 1975 and 1976 for his role. While on the show, Walker's character was known for the catchphrase "Dy-no-mite!" which he also used in his mid–1970s TV commercial for a Panasonic line of cassette and 8-track tape players. He also starred in Let's Do It Again with John Amos, and The Greatest Thing That Almost Happened with James Earl Jones. Walker continues to tour the country with his stand-up comedy routine. Walker was born in The Bronx, New York. Walker attended Theodore Roosevelt High School in New York City. Through a federal program known as SEEK, or "Search for Education, Evaluation, and Knowledge," he continued his studies and entered into the field of radio engineering with WRVR. As a young man, Walker was a vendor at Yankee Stadium, starting with the 1964 World Series. He was given a silver dollar by Mickey Mantle, which he still has. Walker was very friendly with Gary Cohen, who went on to be operations manager at Yankee Stadium. In 1967, Walker began working full-time with WRVR, the radio station of the Riverside Church. In 1969, Walker began performing as a stand-up comedian and was eventually discovered by the casting director for Good Times, after making appearances on Rowan & Martin's Laugh In and on the Jack Paar Show. He eventually released one stand-up comedy album during the height of his Good Times popularity: Dyn-o-mite on Buddah Records (5635). During Good Times' 1974–75 season, Walker was 26 years old, though his character was much younger. John Amos, the actor who portrayed Walker's father on Good Times, was actually just eight years older than Walker - 38 years old when the show ended its run at the end of the 1978–79 season. Walker credits producer/director John Rich for inventing "Dy-no-mite!" which Rich insisted Walker say on every episode. Both Walker and executive producer Norman Lear were skeptical of the idea, but the phrase and Walker's character caught on with the audience. Also, off- and on-camera, Walker did not get along with series' lead, Esther Rolle, who played Florida Evans, in the series, because she and Amos disapproved of Walker's increasingly buffoonish character and his popularity, and Walker felt hurt by their disdain. Dissatisfaction led Amos (before Rolle), to leave the show, making Walker the star of the show. Walker was the only Good Times star to not attend Rolle's funeral. According to an appearance on The Wendy Williams Show on June 27, 2012, Walker stated he has never been married nor fathered children. Walker appeared on The O'Reilly Factor on July 11, 2012. He stated that he did not vote for Barack Obama and that he would not vote for him in the 2012 election either. In an interview with CNN, Walker described himself politically as a "realist independent" and stated that he opposed affirmative action, saying that it had outlived its usefulness. He also said that he was against gay marriage on moral grounds, but believed legislation for its legalization should be passed, stating it was not worth fighting against. Walker described his political beliefs at length in his autobiography, Dyn-O-Mite: Good Times, Bad Times, Our Times: A Memoir. In it, he called himself a "logicist," who believes in "logic and common sense." He holds typical conservative positions on the death penalty, the size of government and capitalism. However, Walker is in favor of amnesty for the children of illegal immigrants and a system of universal health care for the United States. He voted for Ronald Reagan and noted that he also "loved Bill Clinton as our president" for welfare reforms instituted under his administration. ↑ "Jimmie JJ Walker's Gigs". Retrieved 2008-08-18. 1 2 "Jimmie 'J.J.' Walker lights 'Dy-no-mite' on gay marriage, Leno and dating". CNN. July 16, 2012. Retrieved February 12, 2012. ↑ "Jimmie 'J.J.' Walker enters No Spin Zone". Fox News. July 11, 2012. Retrieved February 12, 2013. O'REILLY: Did you vote for him first time around? / WALKER: I never voted for him. ↑ "Let's Do It Again". Turner Classic Movies. Retrieved May 21, 2016. ↑ "Rabbit Test". Turner Classic Movies. Retrieved May 21, 2016. ↑ "The Concorde ... Airport '79". Turner Classic Movies. Retrieved May 21, 2016. ↑ "Airplane!". Turner Classic Movies. Retrieved May 21, 2016. ↑ "The Greatest Thing That Almost Happened". Turner Classic Movies. Retrieved May 21, 2016. ↑ "Murder Can Hurt You". Turner Classic Movies. Retrieved May 21, 2016.